Article first published as Blu-ray Review: Airport (1970) on Blogcritics.org. Airport, released in 1970, ushered in a wave of ‘70s disaster flicks that included The Poseidon Adventure, The Towering Inferno, and Earthquake. These films were all built around a similar formula where a group of people are faced with some kind of natural or man-made disaster that they must find a way to escape from. 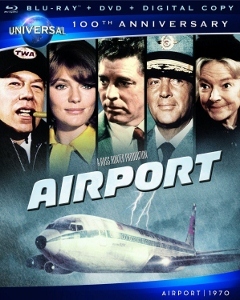 Airport was not only popular with movie-going audiences, making over $100 million at the box office (that’s about $530 million, adjusted for inflation), but with critics as well. The film earned 10 Oscar nominations including Best Picture and Best Adapted Screenplay. Actress Helen Hayes won the award for Best Actress in a Supporting Role. With the film’s achingly slow build, soap-opera character storylines, and geriatric stars, it’s hard to believe the film was as overwhelmingly popular as it was. Airport is based on the 1968 novel by Arthur Hailey. The ensemble cast is built around both airline passengers and the ground and flight crew. Throughout the first half of the movie we are introduced to them, with little slices of what each was doing on the day of the flight. While the stories weave back and forth among the ensemble, the primary focus is really Mel Bakersfeld (Burt Lancaster). Bakersfeld is the manager of the fictional Lincoln Airport in Chicago. A major storm has hit the airport and Bakersfeld is juggling numerous delayed flights. They’re short one runway when a plane skids off one in the ice. On top of his demanding job, Bakersfeld has an equally demanding wife, Cindy (Dana Wynter), who is jealous of her husband’s devotion to his job. Their marriage is on the rocks, but Bakersfeld doesn’t have time to deal with it, despite his wife’s constant nagging. The scenes with Bakersfeld’s wife are over the top and ultimately inconsequential to the overall story. The plot is focused on this type of melodrama more than the impending airline disaster itself. The pilot (Dean Martin) wants the stewardess (Jacqueline Bisset) he has been seeing to have an abortion. In addition to his already troubled marriage, Bakersfeld is having an affair with Tanya (Jean Seberg), the public relations agent for the airline. George Kennedy plays Joe Patroni, an airline mechanic called in to assist with the plane that has gone off the runway. Aside from the fact that Patroni would rather be at home with his wife, his character is one of the few to be focused on the actual problems of the airline. In one of the more amusing side stories, an elderly woman (Hayes) has been making a career of stowing away on numerous flights. Her methods seem ludicrous by today’s heightened airport security standards, but apparently they were not quite so outrageous back then. It’s nearly half way into the movie before we really get a hint of the actual disaster in this disaster movie. D.O. Guerrero (Van Heflin), who is down on his luck, plans to set off a bomb on the plane. He buys a bunch of life insurance with the intent that his wife will be taken care of after his demise. Guerrero’s plans are almost foiled, in part due to the elderly stowaway who managed to sneak on the doomed plane. However—spoiler alert!—Guerrero does manage to detonate his bomb, but this does not force the plane down. Instead the pilot and his crew are forced to land the damaged plane at the icy airport on a compromised runway. It’s only then that the real disaster element comes into play. While the post-bomb scenes are suitably tense, everything before that lacks any kind of excitement at all. It’s hard to think of Airport as a real disaster movie, considering how long it takes to get to the incident and how quickly it wraps up after that. It would not be until the subsequent sequels that disaster would become the main focus of the storyline. Of course Airport is also notable for it being (along with its sequels, as well as another Arthur Hailey story, Zero Hour) the partial basis for Airplane!, which effectively parodies the melodrama while actually providing an arguably more tense disaster. The Blu-ray’s1080p, AVC-encoded transfer is very clean, with no visible signs of print damage. Airport looks pretty sharp, with a fair amount of fine detail coming through. The colors are kind of muted, intentionally it seems, so don’t expect to be overly impressed in that department. Black levels are really deep, enhancing the dramatic effect of low-lighting scenes (like anything occurring in the cockpit). The 5.1 DTS-HD Master Audio soundtrack shows the age of the movie with a dated mix that emphasizes trebly dialogue and score. There isn’t much range or diversity, with a thin, bass-deficient sound. But even though it isn’t fancy, there’s nothing wrong with it. Dialogue is clear throughout. No special features specific to Airport are included. As with their other 100th anniversary releases, Universal has tacked on a couple of generic “100 Years of Universal” featurettes. In this case there is “The 1970s,” which focuses on Universal productions from this decade, and “The Lot,” which looks at the Universal Studios backlot. A standard DVD of the feature and a Digital Copy are also included. Overall it’s hard to fully recommend Airport. The film is incredibly dated and is not all that exciting as a disaster flick. Anyone who is a fan of the ‘70s disaster genre may still get a kick out of watching it. It is certainly not hard to watch and the performances from Kennedy and Lancaster make it somewhat worthwhile.